How good is the Trader Joe’s wine department compared to other grocery stores? Most shoppers love the convenience of finding all their grocery needs at one store. Having a good wine department is a plus. So how does the Trader Joe’s wine department measure up? The single bottle wine price. You do not need to buy four bottles or six bottles to get the lowest price. One bottle, one price. Trader Joe’s carries some interesting and offbeat labels. 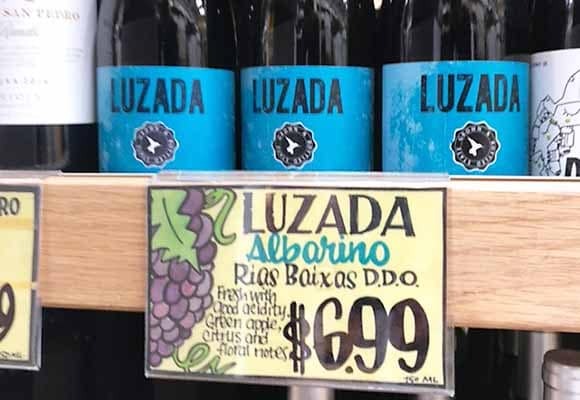 Photo above shows a good-tasting Albariño at a great price. Trader Joe’s does carry a lot of Supermarket wines. * These are priced competitively with big stores like Safeway, etc. There is a good selection of imports from France, Spain, Chile, Argentina, and other countries. Wine signage is creative and informative. The staff is friendly and tries to help. If they don’t know about the wine, they often consult their wine expert. Trader Joe’s carries the most interesting food items of any other store where we shop. Wine is always fun with unique foods. Wines with the Trader Joe’s label are secretive. For example, Trader Joe’s Grand Reserve Pinot Noir Santa Lucia Highlands Lot 80: Which winery and winemaker made the wine for TJ’s? Many of the imported wines are unfamiliar producers. They cannot be found on Wine-Searcher.com for price comparison or ratings. 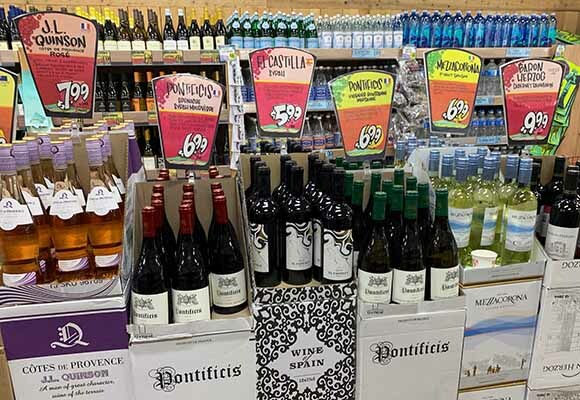 Trader Joe’s touts their own-label wines as being terrific-tasting wines. That is not always the case. Some wines are purchased by TJ’s on a one-time basis. When they are sold out, there is no more to be had. I did some comparative shopping between Trader Joe’s and the Safeway wine prices. I used the big-production or supermarket wines for comparison. For the Safeway, I used the one bottle price, not the price one gets for buying six wines, mix-or-match. I also did a comparison for these wines at Costco. I did not find all the same wines at Costco, but the ones I did find were all slightly less than Trader Joe’s. I do believe that overall Costco has the best wine prices than any other grocery store or wine shop. In a previous article on GoodCheapVino.com, our tasting club listed our Favorite Wines at Trader Joe’s. For the most part, these wines are usually available throughout the year at most Trader Joe’s in the San Francisco Bay Area. * Supermarket wines are high-production wines that are distributed widely in grocery stores, Costco, and big retail wine shops like Total Wine. The wines are produced in a way that makes it likely they’ll taste the same, vintage after vintage. Not to say Supermarket Wines are bad, they just become boring after awhile. If you drink wines on a regular basis, experiment with different wines and expand your wine horizons. Loved this atticle! Love TJ’s! Thank you! Your review is spot on; honest and concise. A big thank you. Fine article! Unfortunately I think many consumers impulse buy and in the process get charged more for wines. Shopping for quality and price takes time and Good Cheap Vino is a great tool for local consumers. I agree with Joe’s assessment of the TJs wine department, both the pros and cons. I also agree that, overall, Costco has some of the lowest priced wines. I do wish that both TJs and Costco would do more with their wine departments. Both have the resources and buying power to bring us quality wines at attractive prices and provide information on who produced the wines. The TJs and Costco I frequent are in a more upscale part of the Sacramento area where customers do buy a lot of wine and are looking for quality. IMO, having a wine specialist available at times to talk about featured wines and the wines in general could only help sales. Costco occasionally does have a special display and winery rep available for a single winery but that is a minimal effort. Costco also has an employee that appears dedicated to the wine department. Curiously, this person does not seem overly knowledgeable or even friendly for that matter. And, this is in a store that displays $100+ bottles of Cab. It would be interesting to know what Costco is thinking as regards their wine departments.